Special one-shot issue illustrated by Ryan Kelly (Lucifer, Three)! We leap back to the recruitment drive for the Clarke astronauts - the ship's launch is imminent, and time is running out to find a suitable crew. 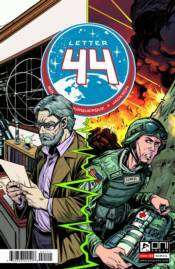 Two possibles have been identified: Donald Pritchard, renowned astronomer, and Alberto Gomez, a skilled soldier in the US Army with extensive medical experience - but Project Monolith's recruiters will need to push past every limit to convince these men to leave their world behind... forever.